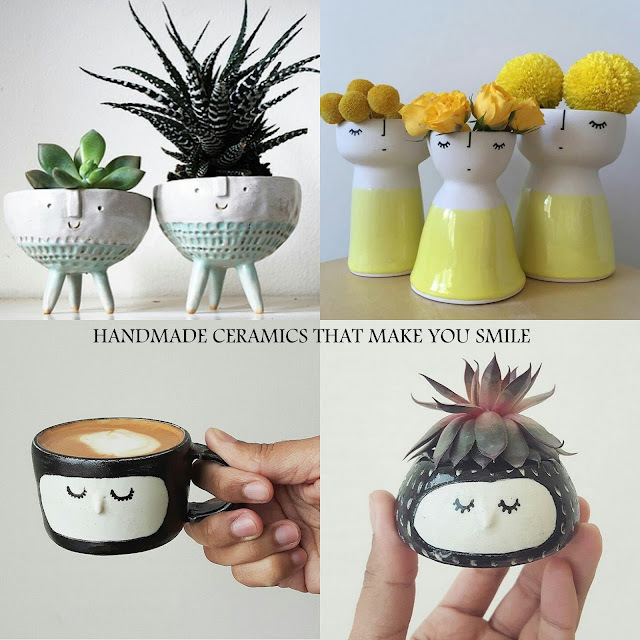 DESIGN CRUSH: HANDMADE CERAMICS THAT MAKE YOU SMILE - HIP HIP HOME! If you ask me, turning a humble material like clay into something beautiful and functional is pretty incredible. That's what ceramic artists do, day in and day out. Today I am talking about these talented artists, who can put a smile on your face while working their magic with clay. I am so in awe of these women, that it's an honor to be talking about them here. 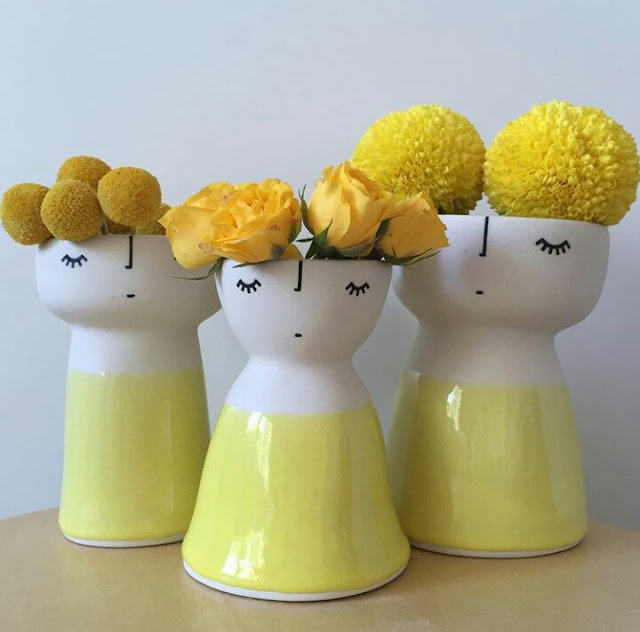 Vanessa Holle, the artist behind the vanessabeanshop is a designer and maker from Sydney, Australia. Her ceramics include vases, bowls, plates, but what I am most drawn to are her vases. On her page, she describes how she loves figurative sculpture and her tendency to put faces on everything! Shop her adorable ceramics through her Etsy store. Good news, she ships worldwide! How fun are these His & Hers vases. Follow along her Instagram journey, where Vanessa shares more of her creative process. Vanessa explains, how she keeps it new and exciting for her by painting exactly what she feels on that day on the vases. Or in her words little expectant vase faces. Do I hear an Aww? If you live in Australia, more good news - you can enter for a chance to win one of her special vases on the The Life Creative website. I love how each vase is unique and colorful. Hinkleville is run by one girl - Janet, in Toronto, Canada. Janet makes fun and colorful ceramics, planters, jewelry and more. I first read about Janet on the Contourue blog. 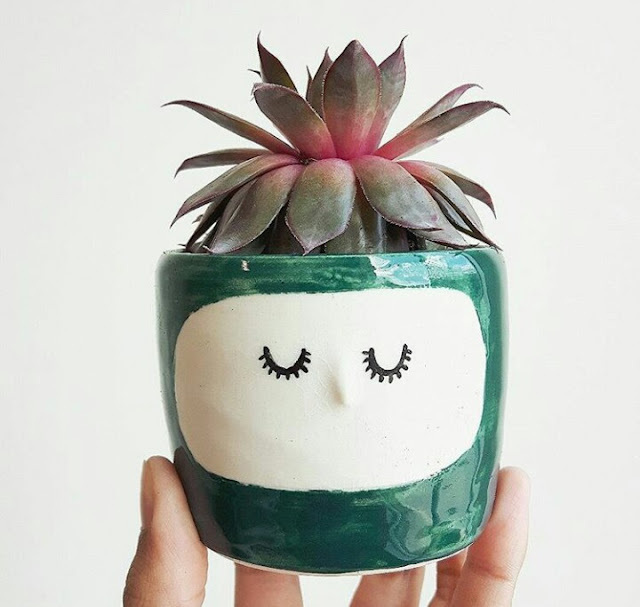 I fell in love with her mugs and planters, which she lovingly calls 'sleepy faces'. Ain't that adorable? I am confident everything tastes better in this handmade mug. 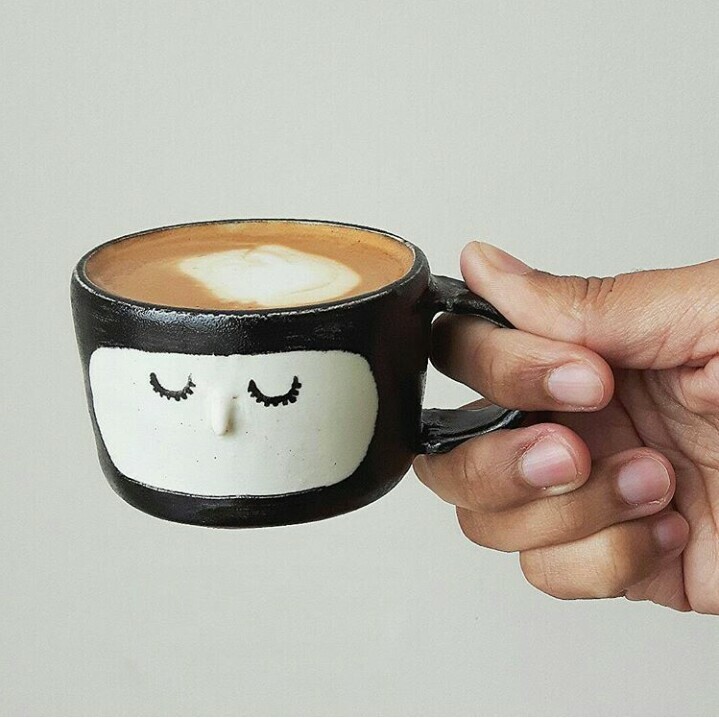 I love the details - the sleepy eyes, the tiny nose and the shiny glaze. If you are in Toronto, Janet always announces all her local events and sales in advance on Instagram. You can also shop though her Etsy store, or through one of her several stockists - Shop Sooth Sayer Hunter and Hare, Rowan Toronto, Bud and Thistle. 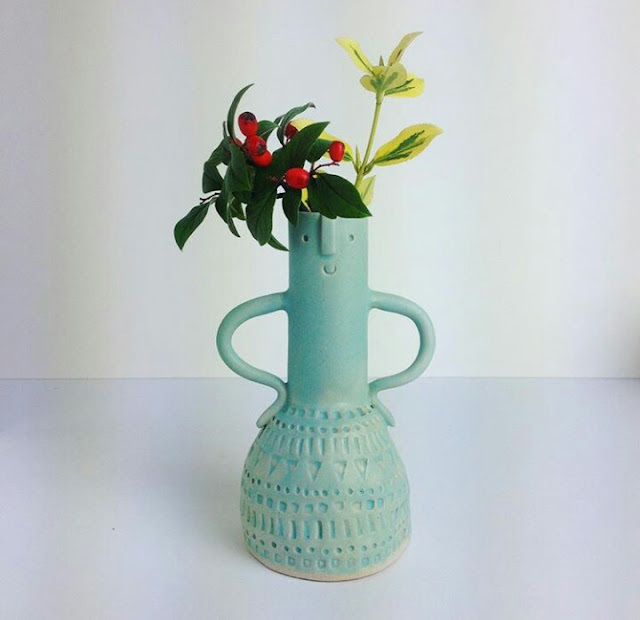 Atelier Stella, established in 2012, is an evolving collection of unique ceramics handcrafted by Stella Baggott in Brighton, England. 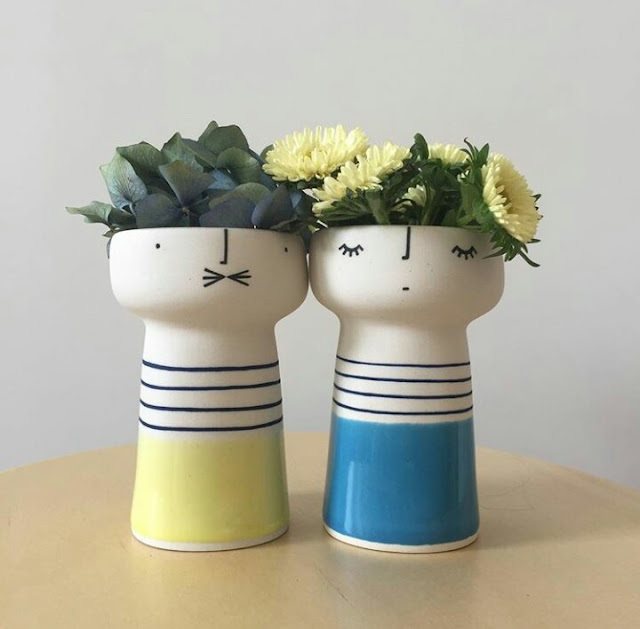 Inspired by Swedish, Cornish and Italian potters from the 50's and 60's, Stella's modern and stylish interpretation will certainly put a smile on your face. I love her signature carved pattern and the little happy faces which she puts on every piece. Stella says she's been putting faces on pots for over 4 years and still loves them. We love it too, Stella! Not only do I love how the personality of each vase, I also like the dusty blue and pale pink glazes. Stella also recently collaborated with West Elm and the collection is almost sold out, so get it while you can. What's common among these, other than the fact they are unique, beautiful and handmade? The faces of course - they sure add a touch of whimsy! All these artists are so in demand, that you will have to watch their sales to snag the pieces you want, and sometimes they sell out in under an hour! Their sales are always announced in advance, so watch out for them. One of my favorite things about handmade pottery, is flipping the piece over and seeing the maker's signature at the bottom. It doesn't get more special than that, does it? Hey M! I'm so glad u enjoyed it! 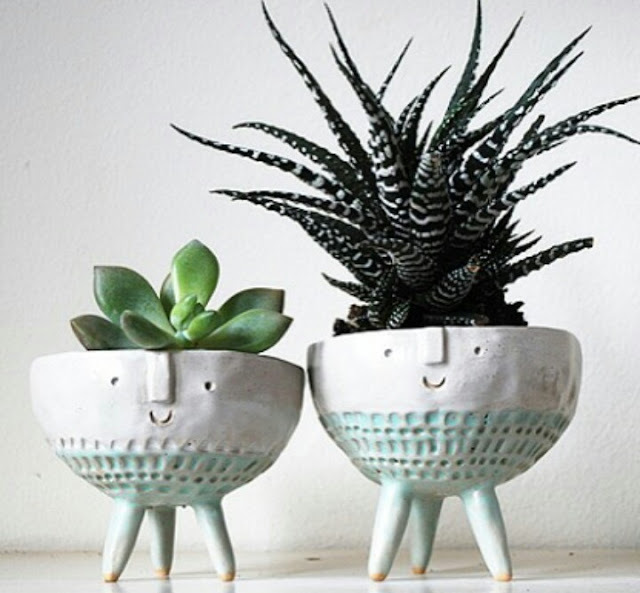 I'm a big ceramic lover too, esp ceramics with personality! I am in love with their work ��. I want that mug from Hinkleville, so adorable! I know , so cute right !! ���� They are really tough to come by, always sold out unless you really watch the sales.